This idea has been merged into another idea. To comment or vote on this idea, please visit Offer Co-branding with Enterprise Edition. I would be like to know if there is any feasibilty to insert a company logo into SF? Pls , you response will be highly appreciated. I have finished the third step. In the fourth step; i have clicked the button insert image, a pop up window appeared there i have selected the folder where i have uploaded my image as document and It is displaying no matches found. I don't have anything to show you. 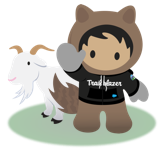 Try searching in the Help inside of saleforce for "Apps". Sorry for annoying you .. the image has well been uploaded and i have well done the process you asked me but its not working .. i'm sure there is a simple thing that is blocking .. can you you show me an example pls? Copy the image and paste it into something like Paint. Then save as either a JPG or PNG file and upload that as a document. Do not use Word. The answer to Which application depends on what you want your users to see when they select the apps in the top right. If you want your logo for all apps, then you must edit and change the image for all of them. I Completely agrree with your ideas for the insertion of the logo but i'm encountering a real problem. I've tried to diminish my logo with the dimension recommended but when i save it under Word it exceed the 20ko .. with which application i need to registered the logo? 1.) Create a logo with roughly this size (253px × 55px). 2.) Upload as a Document in salesforce (set so everyone can view it in a public folder). 3.) Click on Setup, then Create, then Apps. 4.) Edit each of the Apps in the list to set the Custom App Logo to the image you uploaded in step #2. To test, Switch the dropdown in the top right to the app you just changed. Exactly, in the top left corner. Actualy there is Salesforce CRM service. Can you just tell me how can i change the logo? You mean like in the top left corner? Upload you logo as a Document, then Try "Setup / Create / Apps". Name it, Add your tabs and link in your logo that was uploaded as a document.